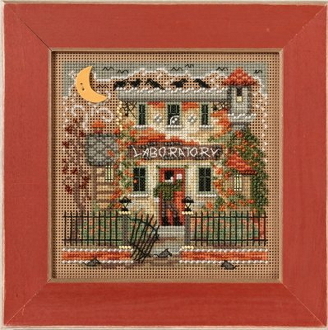 A spooky counted cross stitch kit depicting Frankenstein knocking on the door of his Haunted Laboratory. Adorn with the enclosed Mill Hill ceramic Moon button. Design size: 5.25" x 5.25" (13.3 cm x 13.3 cm). Frame sold separately, see item 40-210 Rust frame (GBFRM13).